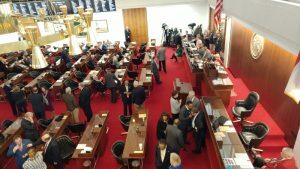 Late in the afternoon Wednesday, state representatives waited for word that the Senate had taken action to repeal HB2. The Senate didn’t do its job. I don’t know why anyone thought the North Carolina Republicans could be trusted. Again and again, they have played us for fools, and we keep thinking they might do the right thing, just once. The GOP leaders brokered a deal with Governor-elect Roy Cooper and the City of Charlotte, and yesterday, they reneged on the deal. Earlier this year, Charlotte passed a law offering protection to transgender people, codifying their ability to use the rest room of the gender with which they identify. Immediately, the NC General Assembly was called into special session and the GOP rammed through a bill, known as HB2, that nullified Charlotte’s law. But there’s more. The so-called Bathroom Bill was about a lot more than bathrooms. It robbed local governments of the ability to set a minimum wage higher than that of the state. It robbed local governments of the ability to pass any non-discrimination legislation. It robbed workers of the ability to sue employers for discrimination in state courts. Retribution was swift. States began banning business travel to North Carolina. Sports organizations pulled their games and tournaments from the state, costing us tens of millions of dollars in revenue. And the whole rest of the world saw us as backward and hateful. And while the majority of North Carolinians are not backward and hateful, the state Republican Party has gerrymandered voting districts so that it takes more than two Democratic votes to do the same thing as one Republican vote. They they passed a law that would make it more difficult for African-Americans, students and the elderly to vote (because these groups tend to vote for Democrats). The voting districts have been struck down twice by the courts, and the state will have to redistrict yet again and pay for another election in the fall of 2017 because the 2016 election was so tainted by the districts as the GOP drew them. The federal courts also struck down most of the provisions in the voting law. Gov. McCrory, the only governor in the country to lose re-election, was defeated because of HB2. So, last week, McCrory called another special session to pass legislation to send much needed help to areas of the state devastated by flooding from Hurricane Matthew and by recent wildfires. The GOP used that special session to call another special session, in which they stripped power from the incoming governor. Then they went home, and McCrory signed the bill. News came on Monday that the General Assembly was willing to repeal HB2 — the entire thing — if Charlotte would agree to repeal its anti-discrimination law. The incoming governor urged the city to take the deal, and Charlotte repealed its ordinance. I went to Raleigh, hoping to witness the GOP doing the right thing for once, but I came home disappointed. Instead of the clean repeal of the bill that was promised, Republicans added an amendment that would have prevented local governments from passing any anti-discrimination ordinances for six months. Democrats balked, and rightly so. The so-called cooling-off period was not part of the deal, and the whole idea of repeal was so that cities and counties could have the autonomy to ban discrimination. Republicans doubled down, amending the amendment to extend the “cooling-off” period to 30 days beyond the end of the 2017 legislative session. It also would have given them the option to extend the moratorium again and again. In other words, the GOP was never sincere about working with Democrats. Rev. William Barber, president of the state NAACP, issued a statement after the session closed. They lied through their teeth about what had happened during the day, even though we who sat in the Gallery witnessed it. After the Senate failed to pass the repeal, I spoke to Rep. Chris Sgro, who is a gay man and executive director of Equality NC, and he held out hope that something good could come of the special session. It turned out his hope was misplaced, along with the hopes of the hundreds of North Carolinians who came out to witness the state GOP finally doing the right thing. This state’s Republican Party is incapable of doing the right thing. Its leadership is made up of lying, thieving, narrow-minded thugs who care nothing for the people of this state — they people they are supposed to serve. I was there yesterday. All day and into the evening. I saw what happened. Once again, we were betrayed.